In today's fast-paced world of competitive workplaces and turbulent economic conditions, each of us is searching for effective tools that can help us to manage, adapt, and strike out ahead of the pack. Emotional intelligence (EQ) needs little introduction. This "other kind of smart" is the #1 predictor of success both personally and professionally. But knowing what it is and knowing how to use it to improve your life are two very different things. For the first time, Drs. Travis Bradberry and Jean Greaves reveal TalentSmart's proven strategies for increasing EQ. The authors unveil a detailed blueprint that shows you step-by-step how to increase your emotional intelligence via 66 proven strategies that target self-awareness, self-management, social awareness, and relationship management. 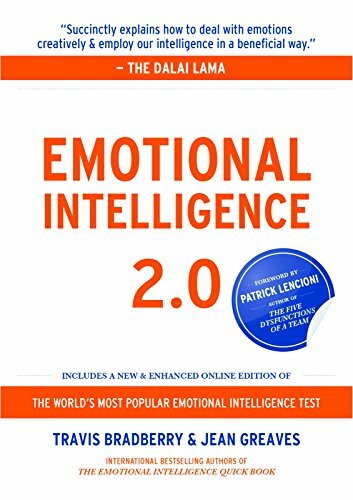 analysis of your behavior to pinpoint the specific skill strategies from the Emotional Intelligence 2.0 book that will have the greatest impact upon your EQ. the ability to test yourself a second time (at no additional charge) after you’ve applied the strategies to see how much your scores have improved. This includes analysis of both score profiles, and suggestions as to which strategies will provide the greatest benefit to you going forward. Gender differences in emotional intelligence. Generational differences in emotional intelligence. Cultural changes in emotional intelligence. Societal shifts in overall emotional intelligence. Drs. Travis Bradberry and Jean Greaves have created a revolutionary new program to help readers identify their emotional intelligence, build their skills into strengths, and enjoy consistent performance in the pursuit of important life objectives.